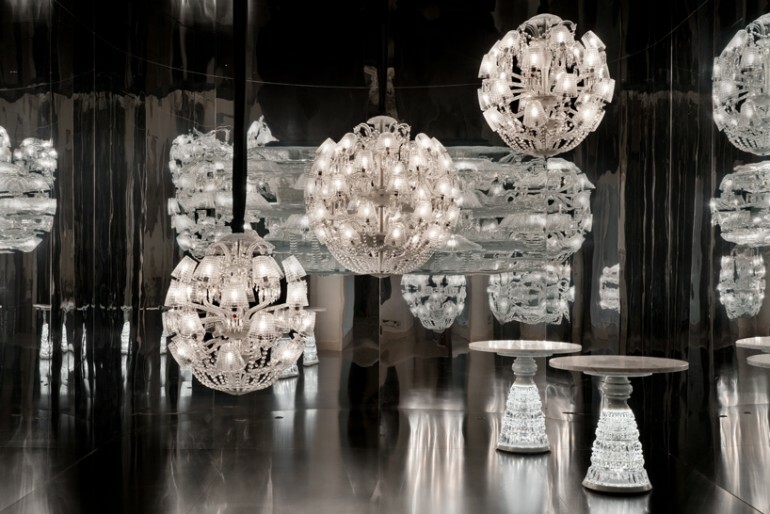 French crystal house Baccarat has collaborated with renowned artists including Hans Van Bentem, Arik Levy and Marcel Wanders over a series of chandeliers that comprise an exhibit called Lumières out of the Box. 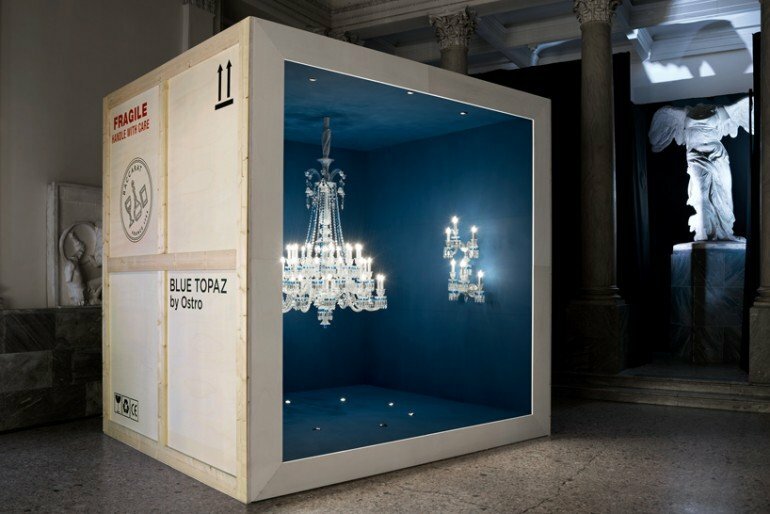 The dazzling fixtures were suspended inside large crates in a nod to the wooden boxes that Baccarat chandeliers were stored in as they were transported. 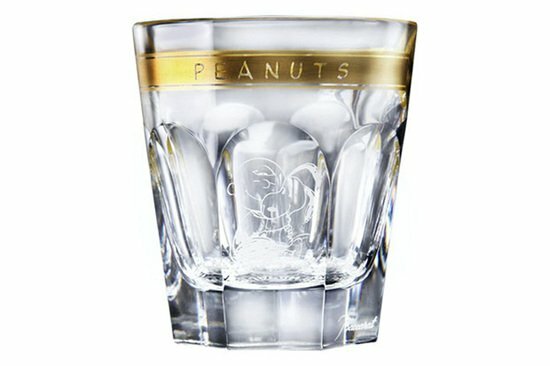 “Exploring the baccarat archives and being able to be inspired by its history, its skilled craftsmanship and its expertise is a privilege. 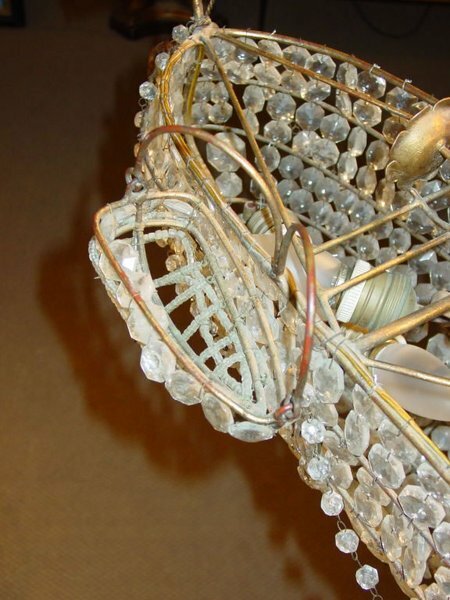 Creating a new crystal object of light generates an emotion, procures a genuine experience and shows first and foremost the power of timelessness,” said Arik Levy. 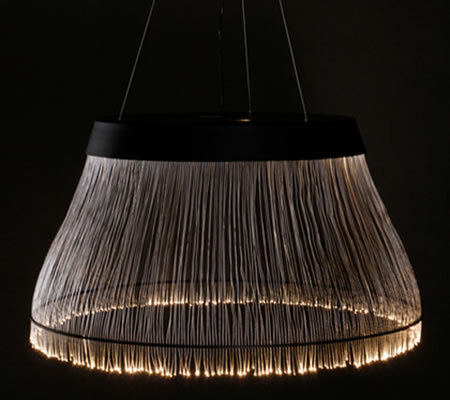 His contribution is a reworking of his 2013 Tuile de Cristal design, this time with 8 levels that play with light, motion and construction. 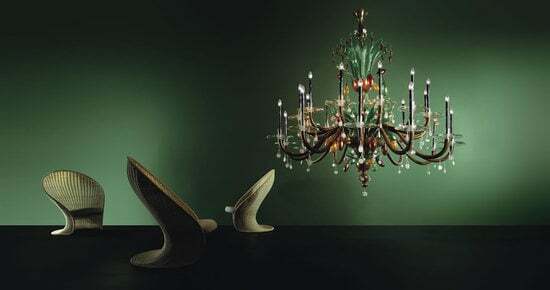 Marcel Wanders presents a spherical chandelier called The Roi Soleil that completely reimagines the contours and shape of a traditional chandelier. With its twisted and contorted branches and cut motifs, this is a true modern interpretation of a classic. 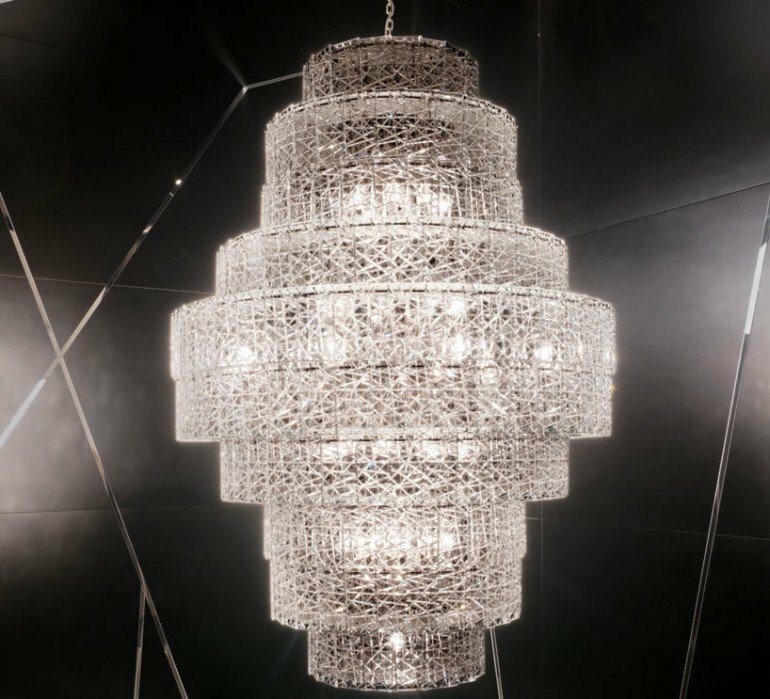 “In an ode to the know-how of the manufactory’s artisans, I set out to celebrate the timeless quality of the zénith chandelier, a Baccarat icon. 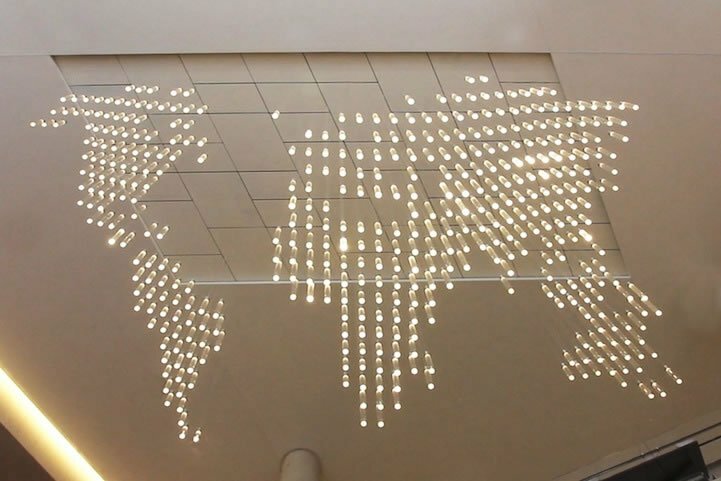 Le Roi Soleil glitters and radiates throughout a kingdom of light,” Wanders explained. 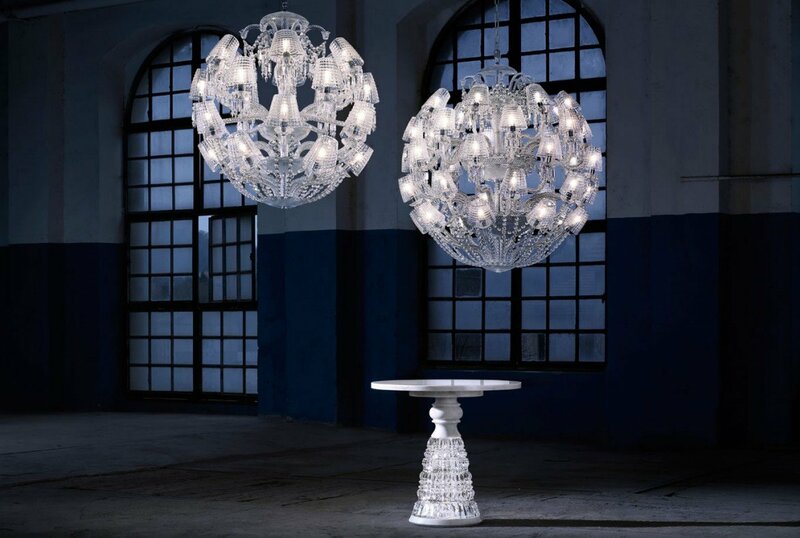 Meanwhile, Hans Van Bentem’s Medicis XXl uses 13,000 octagons in a design that recalls the original marble Medicis vase of the classical period as well as Baccarat’s 1909 crystal take on the same. 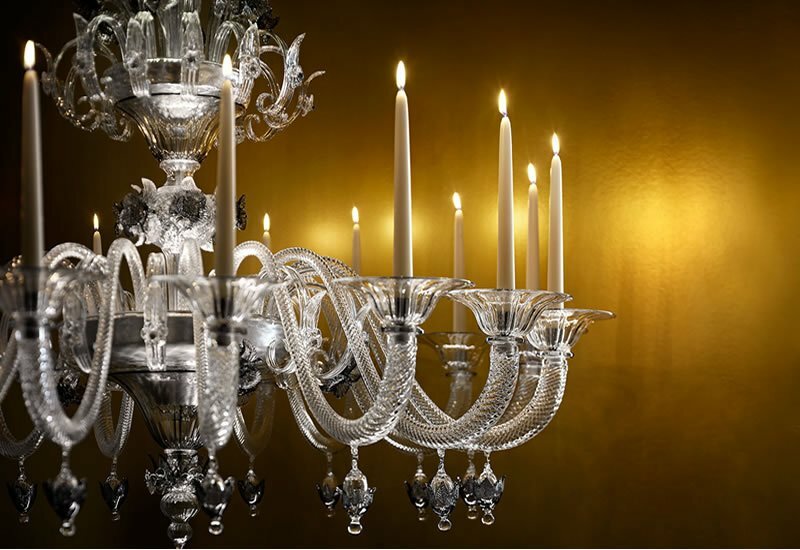 “For me visiting the baccarat factory was like a dream come true. 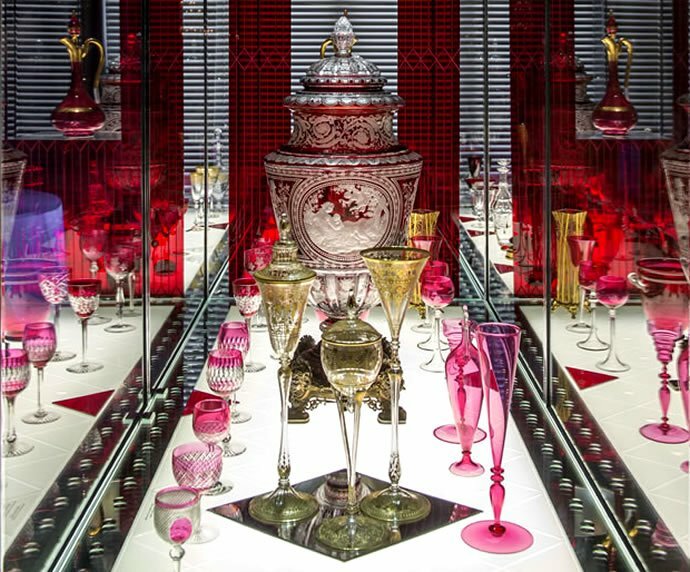 Through this creation, I set out to show the sheer force of baccarat, at once rich with an uncommon heritage and distinctly oriented towards the future,” he said. 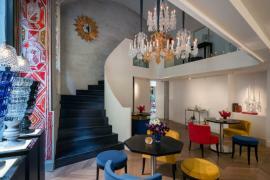 Also worth seeing is the Blue Topaz, a unique chandelier created in collaboration with Maurice Ostro. The design features over 700 blue ostrotopaz gemstones and is dedicated to noted collector Max Ostro. The exhibition is open until April 17 at the Accademia Di Brera (Fine Arts Academy of Brera) in Milan.